Front row (left to right): 1. Larry Farnam, 2. Danny Grieve, 3. Monty Hampton, 4. Roger O’Brien, 5. John Ambro, 6. Archie Chase, 7. Don Crist, 8. Willis Hobbs, 9. Don Lovegren, 10. Art Rosa. Second row: 1. Faye Perry, 2. Nancy Strode, 3. unidentified, 4. Rosemary Armstrong, 5. Judy Perry, 6. Lenore Farnam, 7. Irene Walker, 8. Laurel Mourterot, 9. Alice Bubnar, 10. Judy Moore. Third row: 1. Mr. Sweet (Vice Principal), 2. Barbara Lavelle, 3. Judy Yuskus, 4. Mickey Kehri, 5. Karen Frisby, 6. Barbara Nissen, 7. unidentified, 8. Verna Bethell, 9. Norma French, 10. John Hughes, 11. Mary Claire Ayen, 12. Mrs Wykle. Fourth row: 1. Gordon Johnson, 2. Andy Kappadahl, 3. Wensel Blair, 4. Ralph Laughlin, 5. Mike Cassidy, 6. Benton Mooney, 7. Bill Mustain, 8. Russel Lemos. Credits: Original photograph by Bill Elliot's Studio. From the collection of Alice (Bubnar) Blair. Scanned by Alice Blair. The kids in the picture are members of the high school graduation class of 1957. 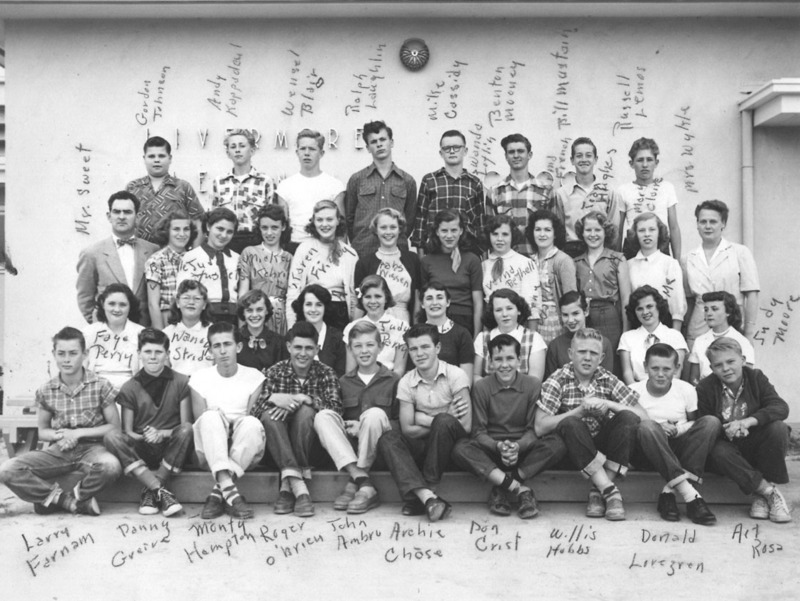 To find other pictures of the class of 1957 in the archive, see Livermore class pictures listed by year of high school graduation. And if you have any pictures of the class of 1957 that you would like to share, please submit them to the Archive.